On Thursday morning, news surfaced that the experimental humanoid who somehow got a job as director of the Federal Bureau of Investigation (you’re not fooling us, James Comey; we know a Frankenstein monster when we see one) wanted to tell the public about Russia’s interference in the 2016 election as early as last summer. He didn’t want to hold a congressional hearing, convene an investigative committee or appoint a special prosecutor. No, when Ol’ Jughead James discovered that America’s mortal enemy was trying to undermine the foundation of American democracy, he wanted to write an article about it. According to Newsweek, Comey gathered Attorney General Loretta Lynch, Secretary of State John Kerry, Department of Homeland Security Secretary Jeh Johnson, national security adviser Susan Rice and others to inform them that Russia was trying to hack the election. Instead of advocating for sanctions, a diplomatic solution or even counterintelligence, the FBI director held up a piece of paper with an outline and offered to fight what amounts to an act of war by writing a public opinion piece. “He had a draft of it or an outline. He held up a piece of paper in a meeting and said, ‘I want to go forward. What do people think of this?’”a source familiar with the meeting told Newsweek. And that is how Donald Trump became president. In case you forgot, Comey is a huge fan of letter writing. After he investigated the Hillary Clinton email scandal and declared that the Justice Department would not indict her, the FBI chief sent a letter to Congress informing its members that he was reopening the investigation. Then, three days before the election, the Lurch look-alike penned another letter that basically said, “My bad. I didn’t find out anything new,” and closed the Clinton case again. Many polls and political experts cite the negative publicity from that action as one of the contributing factors in why Clinton lost a close race to Trump. What is it with this dude and letters? Look, I never trusted the guy, ever since I saw this picture of him standing between Attorney General Lynch and U.S. Attorney Preet Bharara. Come on, son, he’s a Frankenstein! Look at how Lynch and Bharara are staring at him. They know it! I don’t trust any man that tall who doesn’t have a hook shot. There are no 6-foot-8-inch people named “Jimmy.” Look it up. 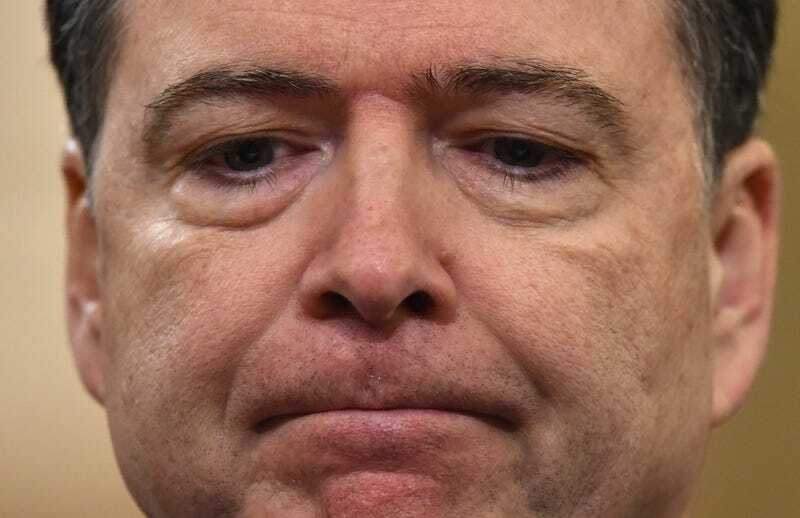 Comey, a longtime Republican, sabotaged the Clinton campaign by using his office letterhead to cast doubt on her credibility, ultimately handing the presidency to a petulant buffoon with a merkin for a hairpiece. Because of him, we have a commander in chief who’s set up a playroom for his daughter in the West Wing of the White House and tries to squeeze in running the country in between rounds of golf. So after Comey went on a rogue letter-writing spree, now white Shrek wants to reveal, “I was gonna say something, but the Obama administration wouldn’t let me”? When Vladimir Putin is standing shirtless behind Trump, taking shots of vodka and screaming “Nyet!” at the next State of the Union address, I bet you will feel a tinge of regret. As you’re writing an op-ed letter to the Washington Post Pravda, apologizing for facilitating the valuable real estate deal that sold America to our new Russian overlords, maybe you can take a sip from the same bottle of Champagne with which Trump and Putin toasted their takeover of the American democracy. I’m sure they saved you a glass—after all, it ain’t no fun if Comey can’t have none.